Belles’ Sports Bar is the perfect spot to bring family and friends for fine food and drinks, socializing and fun! We hope to see you soon! Extensive Menu Offering Something for Everyone! From Jumbo Lump crab cake sandwiches and Salads to Baby Back Ribs and Flat Bread Pizzas, Belles’ Sports Bar & Grill offers something for everyone. Join us for a delicious dinner with family and friends. Belles’ offers FREE Pool All Day Everyday. Belles' Sports Bar & Grill has been serving Frederick Maryland since 1992. 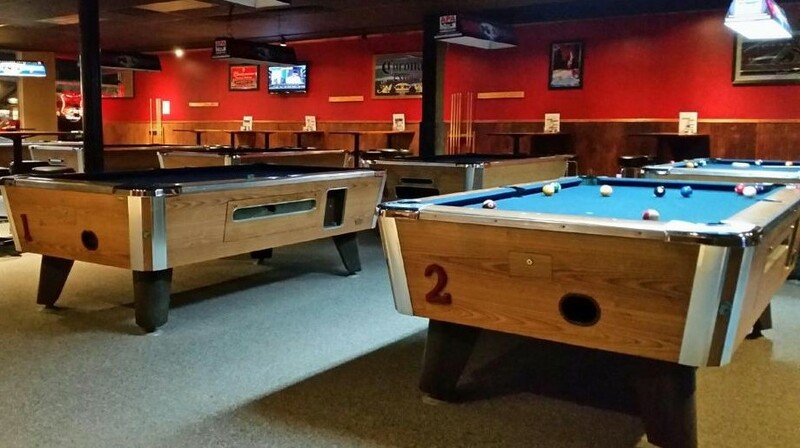 In addition to the friendly service and great food, Belles' offers free pool, darts, Pour House Trivia, APA Pool Leagues, World Tavern Poker, Keno and Racetrax. With 14 Tvs, Belles' is also a great spot to catch local televised sports events. Our happy hour specials are from 11am-7pm Monday through Friday. Maggie was awesome. I stopped at this bar on my bithday and had a phenomenal time. The service was great. I simply came to play pool and the waitresses were always making rounds asking if i i needed anything. When you go here you never have to leave the spot your in. The servers are always running around asking if you need anything. We did order some food and it was as awesome. And mind you this was on a sunday night!!! Great bar. I loved customer service. Drinks were strong, food was great and pool is free if your drinking!!!! Lots of pool tables! My husband and I came in on Saturday night and we actually were able to find two bar stools next to each other – a rarity in Frederick! The bartender was friendly and recommended several beers for us to try and even gave me a sample taste. My husband loved the beer he got and there was quite a selection! I got the Md Shore Platter – a special for the weekend and LOVED it. There was music playing, people playing pool and friendly staff and the other patrons were talkative and nice. The bartender (Maggie) is also the manager and was knowledgeable and always smiling, even when a guest was blatantly rude to her, which I was astonished at but she handled it with ease and a smile. Although the decor is slightly dated, this is a hometown bar with a great selection, yummy food and friendly people. Give it a go! I go there every Saturday for trivia and the service is great, I dont have to pay for pool and the specials are very worth it as is the food.